Today is very special to us, as our blog turned first today. 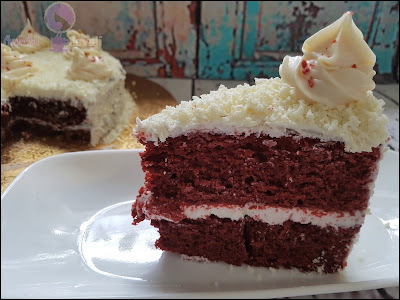 So to celebrate one year of fabulous, adventurers blogging journey, I have prepared this eggless red velvet cake, it's everyone's favorite and all we know is that it has been a favorite for decades all over the world. Red velvet has a mild chocolate flavor which comes from adding of cocoa powder to the batter, with a moist and tender crumb which comes from adding buttermilk to the recipe. Surprisingly it's straightforward to prepare with few steps and needs only one bowl to make a batter. 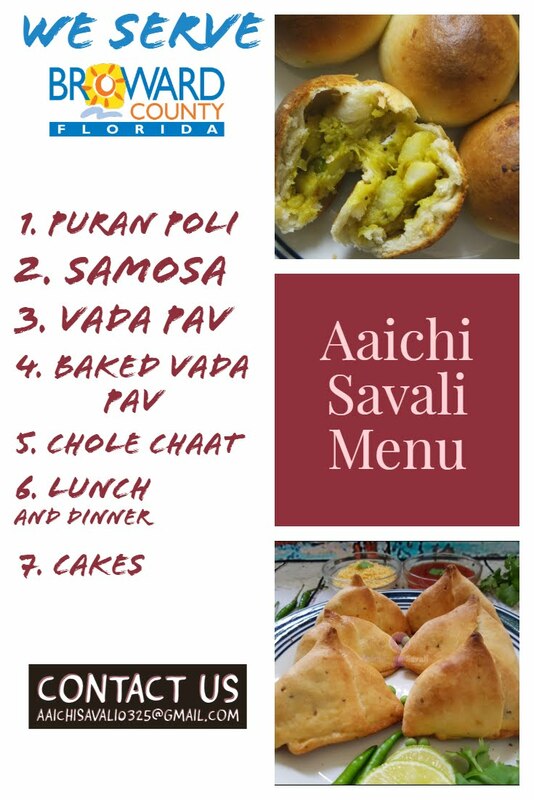 During this one year of a span, I am enjoying and loving baking. There is something so satisfying about baking and making healthy food, by avoiding fried food. I have prepared this red velvet cake lots of time and every time eat came out very well. So let's give it a try! Preparation Time : 15 Minutes ; Baking Time : 35 Minutes. 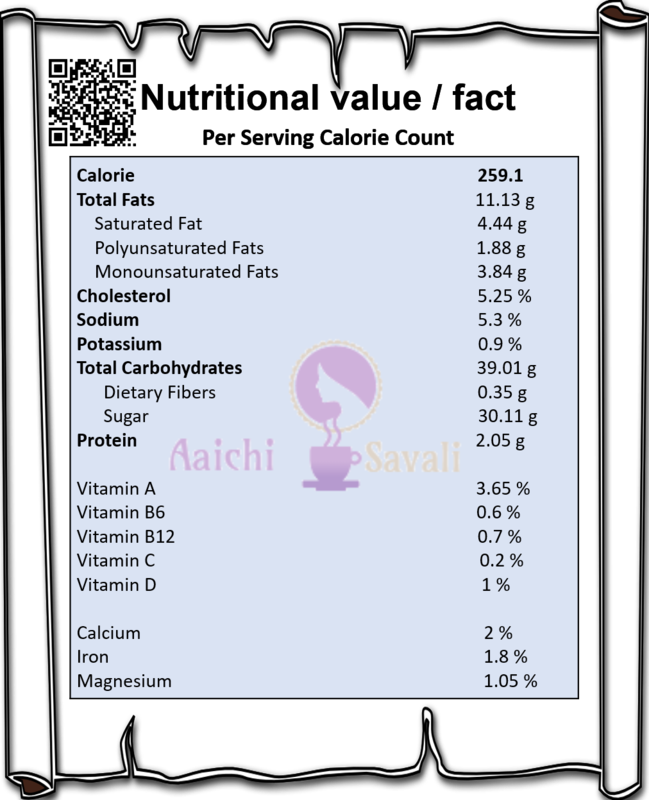 Each Serving Contains 259.1 cal. 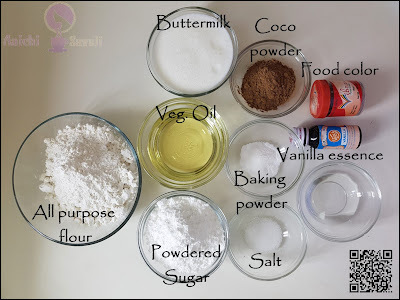 In a bowl, add all the dry ingredients (APF, Cocoa Powder,Salt, Baking Soda, Powdered Sugar) and mix all well. Now to the dry ingredients add all the wet ingredients (buttermilk, veg.oil, vanilla essence, food color) and mix all very well. Now, pour the batter to a 8"
cake tin which is greased with butter and lined with butter sprayed parchment paper. 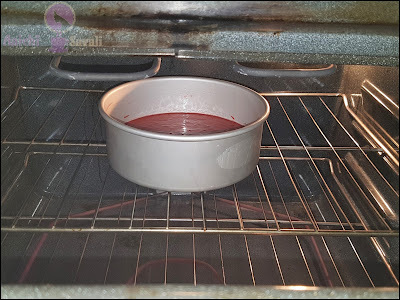 Tap for 3 to 4 times to remove air bubbles and place the cake tin in the oven and bake in the preheated oven for 35 to 40 minutes at 356 F (180 C). Test whether the cake is done after 35 mins with a toothpick if it comes out clean, it's ready, if not bake for another 2 to 3 minutes. and let it come down to room temp, then freeze it for 1 to 2 hour. In a bowl add butter, cheese cream, icing sugar and vanilla essence, mix / whisk it well and refrigerate for 10 to 15 minutes. then slice it horizontally into three layers and keep aside. Apply a little bit of cream and place the first layer of cake. 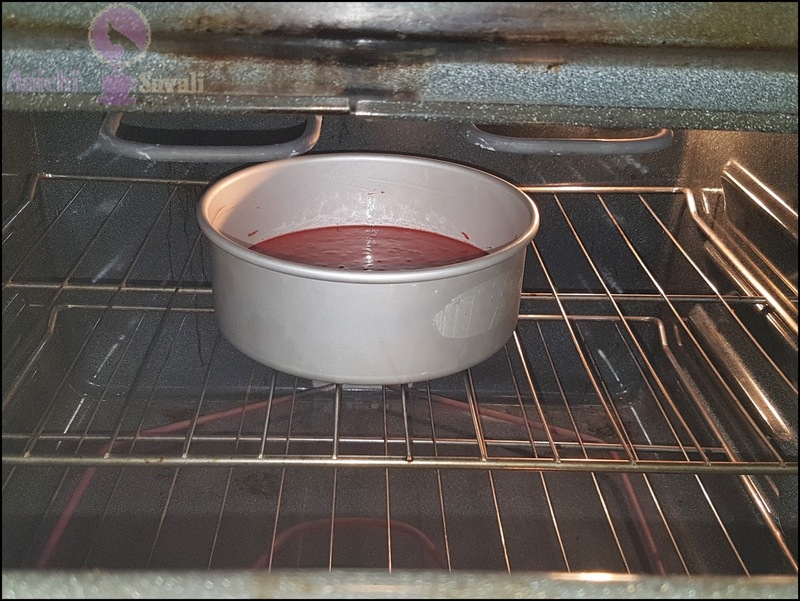 Put 2 tbsp of frosting and spread it and place the other cake on the top and again put the frosting and spread it evenly and refrigerate the cake for 15 minutes. Apply some more frosting and smoothen the cake from all the sides. 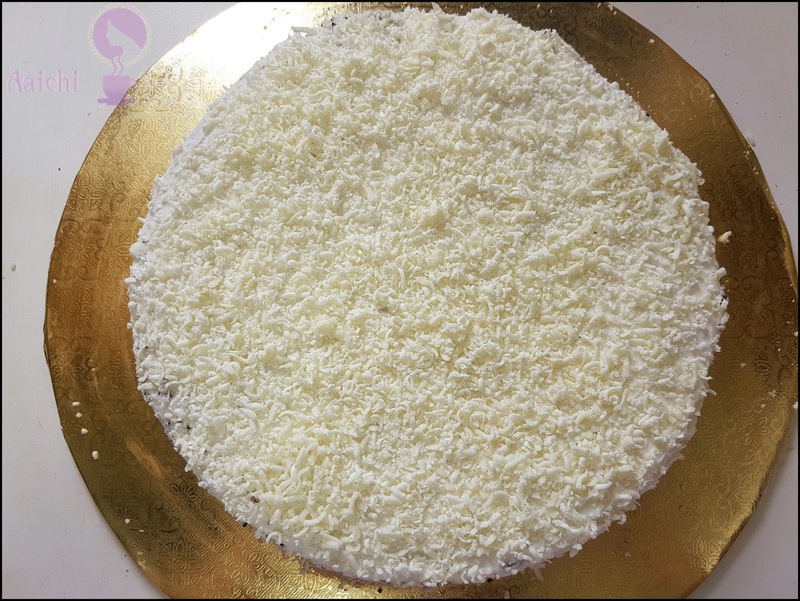 Spread some grated white chocolate. Using leftover frosting make rosettes by adding the frosting to a piping bag and then piping in circular motion. 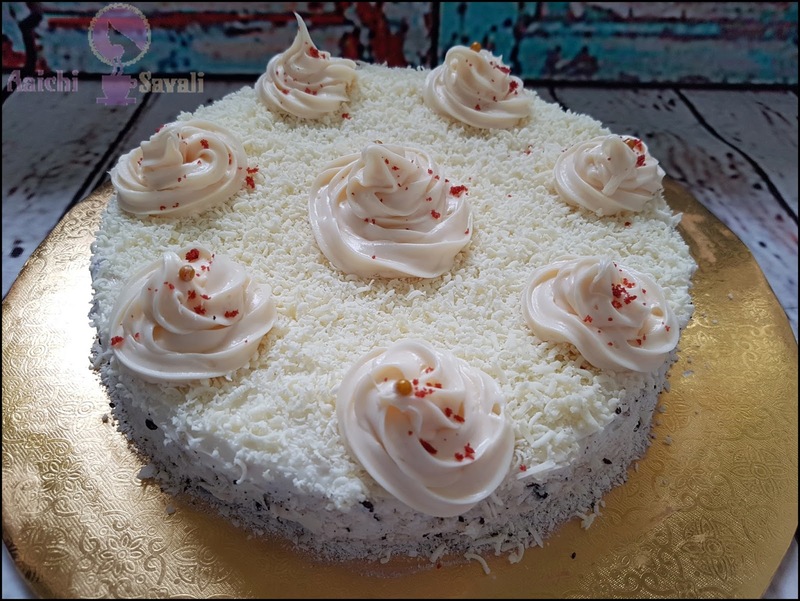 Tadaa, moist and delicious eggless red velvet cake is ready to serve. Enjoy!!! Add 2 cups of salt in pressure cooker and place a wire stand and a perforated plate. Cover and remove whistle if using pressure cooker. Heat in medium flame. Place the cake tin in the cooker and cover and then in medium-low flame bake for 35 -40 mins. If you are baking in a separate pans then just bake for 15 minutes at 356 F.
Per serving contains 259.1 calories, along with carbohydrates - 39.01 g, fats - 11.13 g, proteins - 2.05 g.
It's good to eat red velvet cake as a dessert. Thanks a lot. Red velvet is my favorite too. 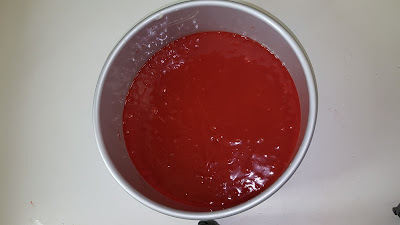 So prepared this eggless version of red velvet cake. For sure give it try, and let me know. Congrats! What is the specialty of red velvet? A lot of people say it is the best.